One of the factors that you must consider when settling for a table, either for home or office use, is your available space. In most cases, you will require a table that is big enough for your whole family, but that can reduce in size to fit in the smallest corners of your apartment. There are endless table options for your dining room, studio, kitchen, or office. To choose the best out of the long list, you have to consider the following: durability, color/finish, sturdiness and stability, cost, shipping and packaging, and size. 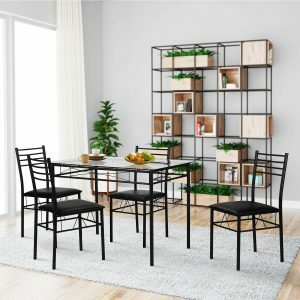 This review article brings together all the factors mentioned to highlight the top ten best saving tables in 2019 reviews. To start us off is this weathered gray-colored dining table which can also be used as a modern console or as a study desk when its leaves are lowered. 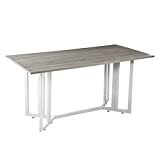 The elegance of this table beats its price as its whitish metal base compliments the gray top to give your dining area a fresh and overwhelmingly gorgeous look. It is big enough to comfortably accommodate six adults and then when not in use, you can lower each of the two 63″ W x 9.625″ D drop leaves to remain with 63″ W x 12.25″ D top; this will save you a lot of storage space. Holly & Martin dining table is also sturdy enough to hold between 50 and 80lbs. weight. If well taken care of, this table will serve you for many years without fading: keeping it away from direct UV rays, dusting and wiping off any and all spills with a soft dry cloth, and keeping it off contact with heat. When it comes to assembly, you don’t have to purchase unique tools; your everyday hardware is all you require for the job. After you purchase this table, it will be delivered to you in a record time and you have the guarantee of zero damages from packaging. Doesn’t come with assembly instructions. 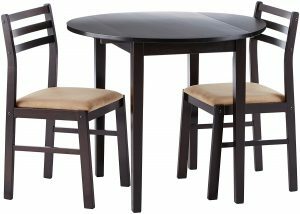 There is no better way of gifting your kids than by purchasing this 3-piece table and chair set. The seats are 11” high so your kids will comfortably play video games, make toys, fill puzzles, read storybooks, and draw/paint comfortably. 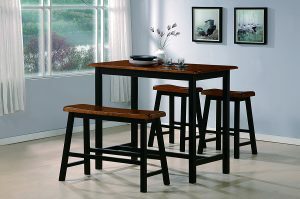 It is made of sturdy hardwood tabletop and legs which are thick enough for stability. It is easy to put together and doesn’t scratch the floor when dragged along. The gloss finish on the tabletop makes for easy cleanup and adds to its durability. Can’t accommodate more than two kids. 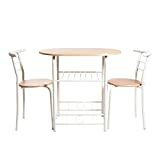 Give your dining area- whether at home, office, studio apartment, or dorm- a contemporary look with this affordable compact dining set with two chairs. The table is cheap and will give you the real value for your money. Its top and the sitting surface for the chairs are made of MDF wood and decorated with a Light Beech PVC Veneer. Looking at the frames, both for the table and chairs, they are made of metal tubes that are coated with a shiny silver-like powder cream to make the set extraordinarily elegant. Not comfortable enough for more than two people. Some screws are hard to fix. Treat yourself to a new class, high quality, and expensive-looking wooden table for your breakfast nook, kitchen, or dining area. 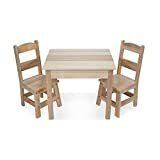 With its Oak Finish Solid Wood Table Top having the dimensions of 48″L x 30″W Coaster Rectangular Butcher Block Dining Table can accommodate a family of four or five comfortably and leave enough space for elbows. Its 29” in height, making it ideal for almost any standard chair you have at home or that you can purchase at your local store. The Shabby White Chic Design Frame will add an extra elegance and will go well with almost every interior décor you can think of for your kitchen or dining area. The table’s feet are flattened to protect your floor from scratches. Wood is generally durable, but you will have the option of requesting for a warranty from the manufacturer via customers’ service- this guarantees you of a lifetime durability. Do you have kids who love playing and dragging furniture around? Don’t worry because this table is stable and won’t fall on them, neither will it get damaged. 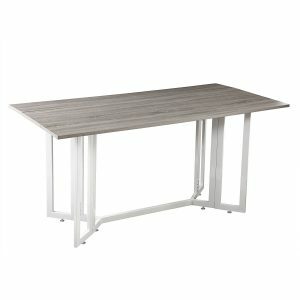 Being a sturdy table, you can convert it to a computer desk for your study room or even to a sewing table. The top scratches when mishandled. 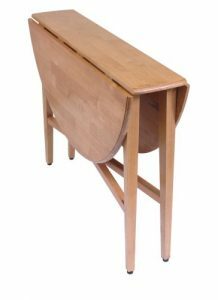 If you are looking for a wooden table that will save you all the assembling headache, that can accommodate up to four adults, and that is collapsible for easy storage in your small studio or kitchen breakfast area, this is the table for you. This table is round when fully opened, has a diameter of 42 inches, and has crossed support rails for additional stability. The size is perfect for a maximum of four people, with all the chairs sliding nicely under the table. It has a height of 29.5 inches, making it a good choice for outdoor parties or indoor round-table meetings. When not in use, you will be closing the two collapsible leaves as well as the support rails. The circular outer edge of the table top is beveled all around both for design and as a safety precaution. 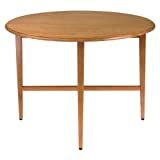 Its casual Light Oak finish, on the other hand, makes the table fade resistant and easy to clean. Being wooden means that the table is durable, but you can add a linen tablecloth to protect it from heat and add to its durability. The slender & tapered wooden legs are made with your floor and carpet in mind as their feet are fitted with rubber paddings to prevent floor scratching. Slender legs may be unstable. Its spread out legs aren’t lockable. Gaps when the drop leaves are opened. Increase your storage space at home or at the office with Jofran 810 table that comes with three included storage shelves on the left-hand side. It is made of solid rubberwood whose Maryland Merlot finish will combine well with the interior décor in your study room or office to give it a fantastic contemporary look. With its perfect counter height, this table is good for multipurpose use within the house- in the bar, living room, kitchen, and dining room. 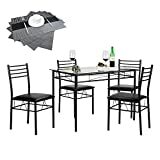 The table is easy to assemble as you will get all the setup instructions that you require- half an hour is more than you will need to complete the job all by yourself. Although it doesn’t come with matching chairs, its dark brownish color gives you an easy time when shopping for a bar stool to go with it. You can place two chairs on either side of the table’s length, but it may be a little bit uncomfortable for more than three big-bodied or tall adults. To add to its durability, and unique elegance too, you can cover the table top with a slab of glass or granite. Wood is soft and easily scratched. Brighten your office, apartment, breakfast nook, or dining area with this 24 by 44 by 36-Inch high table that comes with matching 15 by 18.5 by 24-Inch high stools. The double-layer finish of black and cognac gives the table a fantastic look and sets it apart from other tables in the market. Four adults, two on either side, will comfortably use this set without their elbows brushing. Because the screw plugs are wood, and since the installation guidelines are easy to follow, assembling this table is less than an hour’s job. The quality of the wood used to make this table is exceptionally good that make the table sturdy and stable for bulky items. The stools are high enough for your comfort and can nicely slide under the table when not in use. As of packaging and shipping, this table will get to your destination without a dent or a scratch as it is securely packaged. For kids’ safety, the edges are rounded and the table itself made bulky and stable- it won’t fall on your playful kids or pets. Enjoy quality dining time with your family and friends on this rectangular 7mm tempered glass table that is modern, beautiful, and unbelievably comfortable. The table top is made this thick so that it can withstand mild bangs by kids as well as extremely hot temperatures. Its legs are made of black steel tubes for added stability, sturdiness, and durability. You will get a 5-year warranty for purchase and all your queries and the support you require shall be given to you by knowledgeable and dedicated customer care agents. It comes in a secure package that protects it from scratches, as well as a guiding manual so that you will easily put it together. The table comes as a full set with four ready to use chairs for your family. If you have kids, this table will give you an easy time clearing their mess since a one-time wiping with a wet rag is enough to get it shining. All the four chairs are cushioned and covered with a leather-like material for an added comfort and for easy cleaning. Their backrest is also comfortable for a short dining stay. Comes with a full set of chairs. 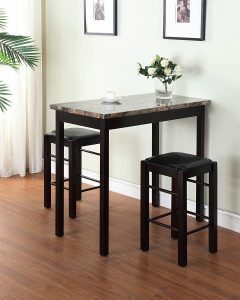 Redefine your dining experience with this casually styled three-piece table and chair set for two. 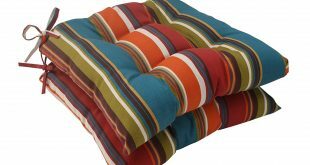 Its unique features include the two drop down extensions and padded fabric seats that make this set’s quality way higher relative to its price. The seats are also durable and can carry as much as 230lbs. 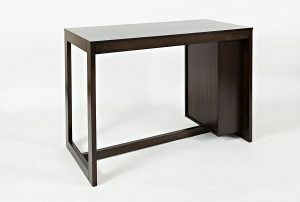 With the drop down extensions opened, you get around 35”D table that can serve you well in your kitchen. It is also 29.25” in height, making it versatile for use in your mini-bar or when studying. Chairs aren’t cushioned at the backrests. Top of our list is this 36 inches high rectangular table that comes with a couple of padded stool seats. Both stools can easily slide under the table to save on space. The table top and the legs are constructed using hardwood, but the top is covered with a faux stone paper-wrapper for easy cleaning. The set’s espresso finish will compliment your home decor and give your dining area a fancy and cool appearance. It’s shipped together with the necessary hardware and guiding manual, giving you an easy time when assembling and reassembling. 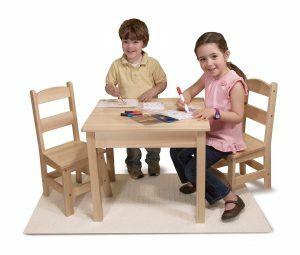 Both the table and stools are firm and will not grow loose as your kids play with them around the house. Cheap for its good quality. 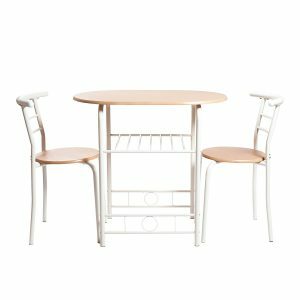 Our list of best space saving tables has incorporated all types of tables- kids’ tables, dining tables, study tables etc. They are all priced, packaged, shipped, and used differently. The common denominator in all of them, however, is the quality of the materials used in making them. We guarantee you that any of the ten tables that you choose to buy will serve you for long and will surpass all your expectations. Take your time to go through each one of them so that at the end of the day, you get the table that suits your tastes and preferences.